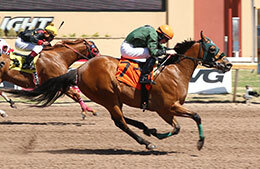 Ferrari James, under jockey David Brown, won the second trial on Sunday at Remington Park. OKLAHOMA CITY, OK�APRIL 10, 2016�Sunday afternoon racing featured six trials for the $337,000 Remington Park Derby for Oklahoma-bred 3-year-olds. At the end of the day, a lightly raced IVORY JAMES colt sits with the second fastest time going into the 400-yard race for Oklahoma-breds. Ferrari James posted a � length win over Bye Byefreighttrain in the second trial to set the second fastest clocking of :20.035 seconds, into a 14 mph headwind. Jody Brown conditions the son of IVORY JAMES for owner Humberto Rivera, Jr.
Weetona Stanley and W.E. Smith bred the gelding in Oklahoma from the Mr Jess Perry mare Ferarri Fast Prize. Jody Brown was up. For the top 10 qualifiers, their times, sires, dams, owners, breeders, trainers and jockeys CLICK HERE.